Japanese cuisine, like Japanese people, is quite distinctive and original. It finds its priorities in keeping maximum taste, shape and structure to the products and their thermo-processing is decreased to the minimum. Harmonization of the healthy eating with esthetics made the Japanese cuisine popular and highly acclaimed all over the world. Japanese people mostly consume fish and rice. Some dishes (e.g. Sushi, Sashimi) are even made of raw fish. They prepare rice without salt, though it’s mostly eaten with various kinds of sauces. Despite existing huge variety of rice, Japanese people prefer their own local rice, as it’s more sticky and suitable for Sushi. Sushi is a world renowned dish. 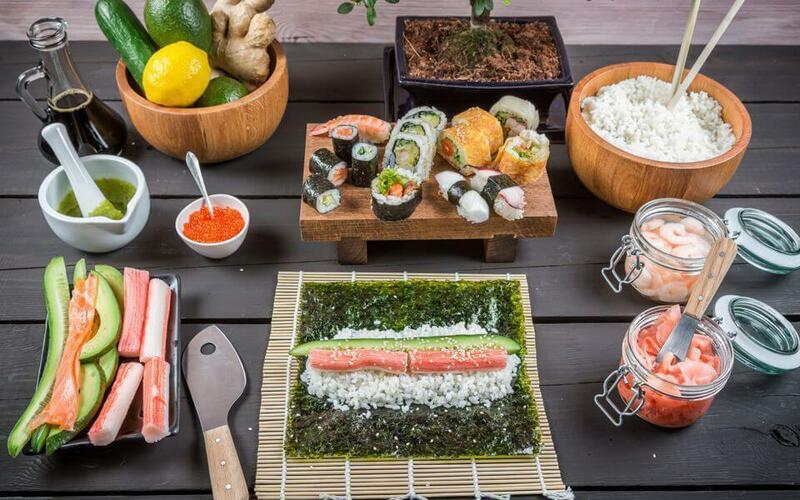 Its major ingredients are boiled rice, raw fish, and Nori leaves, which are made of seaweed. There are more than 200 varieties of Sushi, such as Futomaki, Nigirizushi, makizushi, chakinzushi, etc. Interestingly enough, popular Japanese dish – Tempura – is brought to Japanese kitchen from Portuguese cuisine. Tempura is dough-wrapped roasted prawns; though vegetables and seafood are often cooked the same way. Matsukate mushroom is one of the highly praised products in Japan as it grows seasonally and is quite hard to get. Japanese foodies even enjoy the most poisonous fish – Fugu. Fugu must be prepared only by a chef who has a special certificate and knowledge of processing the fish. If not properly processed, Fugu can cause a fatal outcome. Japanese rarely eat meat. Most popular meat dish is Yakitori – skewed grilled chicken marinated in sour-sweet sauce. Japanese mostly drink green tea, Sake - the rice vodka and rice beer. Japanese dinner and tea ritual proceeds in full accordance with the traditional etiquette.